Born in Brighton, lives & works in Glasgow. 2018: Silent Sleuth – 32 Washington Street, Glasgow. 2014: The Cosmati Edition – Glasgow International, David Dale Gallery & Studios, Glasgow. 2013: Vector – DG Danske Grafikere, Copenhagen. 2010: CPH AIR – Artist Talk & Presentation, The Factory for Art & Design, Copenhagen. 2010: Still Life – In association with SWG3 for the Glasgow International Festival of Visual Art. 2008: Totes Meer – DUNK! Copenhagen. 2007: Stockade – SWG3, Glasgow. 2004: Horatti/Curatti – Atelier Am Eck, Düsseldorf. 2018: Forthcoming – Koldinggade 12, Copenhagen. 2016: Oersted – Glasgow International – Rasmus Danø, Søren Hüttel, Dirty Mac, Dan Miller, Steff Norwood and Kev Pollock. 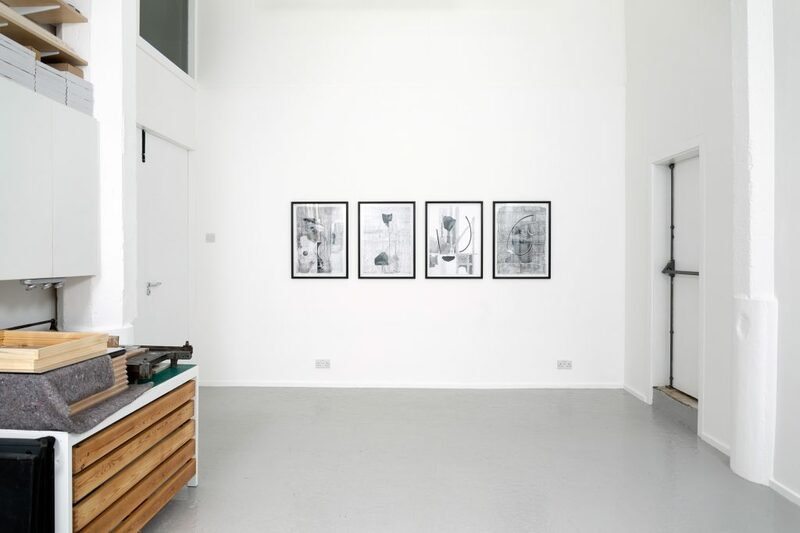 2015: Finite Project Altered When Open – David Dale Gallery & Studios, Glasgow. 2011: LOOT – Curated by HAUNT, The Old Hairdressers, Glasgow. 2011: Industrial Aesthetics – Hunter College Time Square Gallery, New York, NY. 2011: The Queen is Dead – The Glasgow School of Art. 2011: David Dale Gallery at Vault Art Glasgow – The Briggait, Glasgow. 2011: POINT/ LINE/ SURFACE/ SOLID – Alec Mackenzie & Dan Miller, David Dale Gallery & Studios, Glasgow. 2011: No Noise – Are Blytt, Kevin Hunt, Dan Miller, theAGENCY, London. 2010: Modal – Lilah Fowler & Dan Miller – Curated by Oliver Basciano, Cartel, London. 2010: Neil Clements / Dan Miller / Tom Varley – Curated by Yasmin Afschar, Galerie Mark Müller, Zurich. 2010: GO WEST! – Curated by DUNK! (Copenhagen), Galleri KANT, Esbjerg. 2009: Alex Dordoy / Dan Miller / Tony Swain – Curated by Gregor Johnstone, Southside Studios, Glasgow. 2009: Way Out is The Way Out – Curated by Jamie Kenyon, Embassy, Edinburgh. 2009: Alt_Cph – Copenhagen Alternative Art Fair 2009, In association with DUNK!. 2009: Over The Bridge – Curated by DUNK! (Copenhagen), Cirkulation Centralen, Malmø. 2009: Leger Trager – Dan Miller & Kevin Pollock, Grace & Clark Fyfe Gallery, The Glasgow School of Art. 2008: Through the Looking Glass – Curatorial project in collaboration with DUNK! (Copenhagen). 2007: Zuzammenströmmen – Jack Gregory & Dan Miller, 1103 Gallery, Glasgow. 2007: Supermarket – International art fair for artist-run organisations, Stockholm. 2007: The Glasgow Project – Reinraum, Düsseldorf. 2006: A is to B as B is to C – T.Christy Cole & Dan Miller, Lowsalt Gallery, Glasgow. 2004: Spacemakers – Lothringer Dreizehn, Munich. 2004: Panorama – The Old Jail, Glasgow. 2004: Extension – Curated by Market Gallery, Glasgow Art Fair. 2004: Zu Hause – Site-specific project in association with Klemens Golf, Düsseldorf. 2003: Apocalypse Now and Again – Brendan Hessle / Will Holt / Dan Miller, The Project Room, Glasgow. 2003: Max5 – Video festival, Café Gallery Projects, Southwark, London. 2002: Phalanx – The Glasgow School of Art Degree Show. 2018: The Hope Scott Trust. 2015: Glasgow Visual Art & Craft Scheme, Glasgow Life. 2012: Danish Arts Council – International Research Programme. 2012: Creative Scotland – Professional Development Grant. 2010: CPH AIR / Copenhagen Artist in Residence – The Factory for Art & Design. 2010: Scottish Arts Council – Creative and Professional Development Grant. 2009: The Hope Scott Trust. 2008: Scottish Arts Council – Creative and Professional Development Grant. 2006: Creative Lab Residency – CCA Glasgow. 2006: Scottish Arts Council – Creative and Professional Development Grant. 2004: Glasgow Visual Art & Craft Scheme, Glasgow Life. 2004: WASPS/Culture & Sport Glasgow – Düsseldorf Residency. 2015: Glasgow International – Rhona Warwick Paterson – Homes & Interiors Scotland. 2015: My Process – Dan Miller – Central Station. 2011: Future Greats – Art Review. 2011: The Atrocity Exhibition – Andrew Cattanach – The Skinny. 2010: Lilah Fowler & Dan Miller, London, This week’s new Exhibitions – Skye Sherwin – The Guardian. 2010: Glasgow International Festival of Visual Art – Oliver Basciano – Art Review. 2004: Schottland Am Rein – NRZ (Neue Rhein Zeitung). 2004: Alte Helden in Gips – Rheinische Post. 2004: Imperien in Serie – Düsseldorfer Kultur. Head over to the Portfolio page to view a selection of recent work. Check out the blog to keep updated on forthcoming exhibitions and projects. Silent Sleuth Installation shot, 32 Washington Street, Glasgow, 2018.